When it comes to large heavy duty caster wheels, there’s only one brand I recommend. You may or may not have heard of the Miracle Casters. These over sized caster wheels are not optional for me. But an absolute requirement. They are the perfect accessory to any large office chair and a godsend to chairs that continuously get bogged on rugs or carpet. Even when the plastic mat over carpet still isn’t good enough for normal casters. Carpet was my nemesis. As I work from home and the majority of our home is carpeted. Rolling around in my large office chair was simply frustrating to say the least. Being a big boy also didn’t help. The extra weight from my chair and my body really gave the casters no chance of gaining friction among the soft carpet. After trying several brands of computer wheels and experimenting with the grounding beneath my chair; vinyl, plywood, cheap rugs, plastic..You name it..I tried it! I was literally stuck and was even considering ripping up the carpet in our home office to replace with tiles or timber flooring. Naturally this was going to be a costly experience and was shot down in flames within seconds of mentioning it to my Wife. By coincidence (who knows) my Wife was reading through her regular department store shopping emails and BAM!. There they were. The Miracle Casters, shining brightly out of the screen. Bringing both hope and relief to these very frustrated tired eyes. I had never seen or even heard of Miracle Casters before and from the initial picture, I was intrigued. So I just had to look further and deeper into these large heavy duty caster wheels. I ended up getting a set of the Miracle Casters and since that very day, I have never looked back. In fact I have actually fitted all our office chairs with these large casters. They are about double the size of the regular casters you come to expect from a standard office chair. Rather then being 2 inches, these casters are about 4 inches wide. It’s like any wheel really, the bigger they are, the more they can glide over uneven and difficult terrains. They are truly amazing. According to the manufacturer each wheel (Set of 5) can handle 130 Lbs each. So in theory a set of 5 wheels should be able to handle a weight capacity of 650 pounds. Now I’m not in that weight division so I cant state the true potential of these Miracle Casters. But from a combined weight and from other peoples references. I can safely say if you are equipped with these Miracle Casters on your heavy duty office chair, then they may be able to handle a weight capacity of 350 Lbs. Unfortunately with anything good, there is always a down side. The down side being that the Miracle Casters won’t fit onto just any office chair. 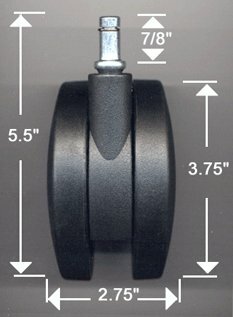 You will have to check the diameter of your current stem to make sure these casters are compatible with your chair. Well I simply love these large heavy duty caster wheels: Miracle Casters. They literally saved me a lot of headaches at home and make working so much easier over carpet. I have never felt such a smooth action over carpet before, until I equipped my chair with these beasts. If your looking for large wheels to get you rolling with minimal issues, then I highly recommend these Miracle Casters. Just be sure you measure you current stem to save you any frustration. Invest now and save in the long run!, that’s how I see it. If you can afford Miracle Casters then go after them!. But if your a little strapped for cash, then what I recommend is you check out the Rolland Extra Large Office Chair Casters. For a less expensive route, these aren’t a bad buy. But I still only suggest these if you can’t afford The Miracle Casters.